Hatteland Display has commercially launched its new display system, the Series X 55” Ultra High Definition Chart & Planning Table. Originally unveiled in prototype form at Norshipping 2015, the system was presented as a market-ready model at this year’s Norshipping show, hosted in Oslo in May/June. 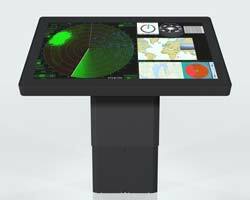 Resembling a giant iPad, with an option for touchscreen functionality, the 4K-resolution display table has been formulated to enable up to four crew members to work on it simultaneously, with its multi-data interface providing up to four separate, split-screen sections covering ECDIS, planned voyage systems, navigational safety info, radar info, and so on. To provide an ergonomic solution for crew, particularly in wheelhouses where space may be restricted, the Series X 55” can be installed in a number of different ways. For example, the display can be mounted onto a tiltable and height-adjustable console (or mechanical pod), enabling crew to gather around it and adjust its position as required. Alternatively, the Series X 55” can be wall-mounted, or installed into the floor for the benefit of seated personnel. Should the user opt for the touchscreen-enabled version, the table is rated for ’40-point’ (or, effectively, 40-finger) response, Lars Skjelbred-Eriksen, vice president for sales and marketing at Hatteland Display, tells Ship & Boat International. Skjelbred-Eriksen adds: “The system is IP66-/IP23-approved, and ECDIS-/radar-approved by IMO. The touchscreen features optical bonding, for reduced glare, and has been developed as a ‘solid sandwich’ – there is no air between the screen glass and the actual electronic display, which prevents dust and grit from getting into the system.” The Series X 55” has been type-approved by DNV GL for maritime use.